ABS-CBN Broadcasting Company recently ranked among the Top 10 most admired Philippine companies and was also included in the list of recipients for the Innovation Award Category. This is based on the 2008 survey, "Asia's 200 Most Admired Companies," released by The Wall Street Journal Asia recently. 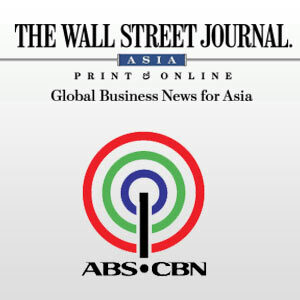 The WSJ Asia has been providing news and analysis of regional and global business developments since 1976. This year, the survey was conducted by research firm Colmar Brunton on behalf of WSJ Asia and covered 2,477 executives and professionals as respondents. The Lopez-owned media conglomerate placed third in the Innovation Award category for offering Internet TV services on TFC (The Filipino Channel) Now. This unit of ABS-CBN Interactive sells video-on-demand in monthly and pay-per-view subscription packages. ABS-CBN is the only media company included in both categories. Founded in 1946, the Kapamilya Network is now headed by Eugenio "Gabby" Lopez III. The current chairman and CEO of ABS-CBN represents the third generation of Lopezes to take over the reins of this broadcasting network as pioneered by the late Eugenio "Genny" Lopez Jr. (Gabby's father) and Don Eugenio "Eñing" Lopez Sr. (his grandfather). Charo Santos-Concio is the newly-appointed president of ABS-CBN.